My favorite thing about gift jar ideas, is the simple beauty, created by presenting homemade gifts from within glass. 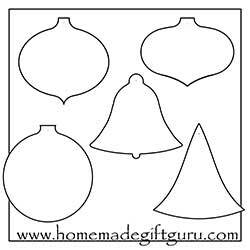 Glass containers provide your gift recipient with a gorgeous view of whatever is inside. In addition to being beautiful gifts, homemade gifts in jars tend to be thrifty to make. The jars themselves cost very little, and most often, the contents needed for mason jar recipes (and other jar gift ideas) are inexpensive as well. Using jars, you can create homemade gifts that are beautiful, warm and sweet, like the cookie mix above... or you can create unique, personalized and decorative gift jars, like this honeymoon beach scene, shared in the HMGG reader gallery. 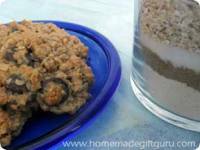 While cookie mix in a jar gifts are probably the most popular of jar gifts, jar gift ideas can range from simple cookie recipes and other food gifts to artistic craft projects, like candle holders and snow globes. Homemade jar gifts are fun, beautiful and a bit trendy... yet they tend to be very quick and easy, a winning combination in my book! 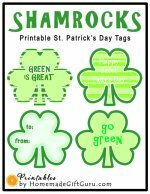 Below, you'll find a variety of themes and gift jar ideas for you to browse. Mason jars are a fun way to show off anything from lovely baking ingredients to elegant bath and body salt crystals, plus they are re-usable. If you're on a very tight budget or you just love being extra thrifty, some of the ideas below will also work with re-purposed jars commonly found in your fridge and pantry. Here's a few tips and ideas for re-purposing glass (I save jars and interesting glass bottles all year long for use in my holiday gift giving projects, it's one of my best budget-friendly tips). Buying, finding and collecting glass jars and bottles all year long, is a fun way to be thrifty, plus sometimes a cute jar or bottle actually inspires a gift idea. 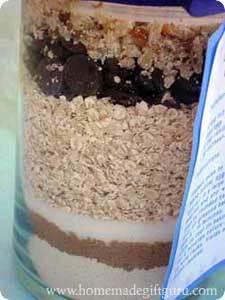 Many mix recipes in a jar can be layered for added impact, preferably if there is significant variation in color and/or texture among the main ingredients. If you've never made a layered jar gift or have troubleshooting questions, here's how to make beautiful layered gifts in a jar, with tips and detailed instructions to be used with a variety of recipes. Candy is a fun item to include in a jar. 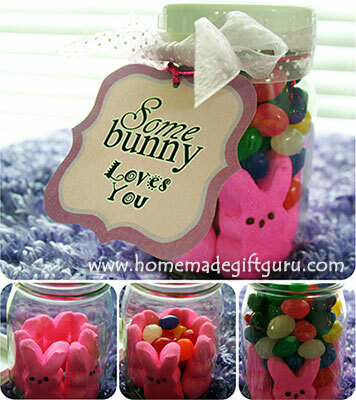 You can make candy jar gifts extra cute by finding seasonal candy that is special for the upcoming holidays, such as the bunny shaped peeps in the Easter candy jar gift to the right. You can buy candy in bulk and choose the best colors for the occasion at hand. You can layer the candy, alternating textures, size and/or colors, or simply add a clever coordinating gift tag, such as "I LOVE YOU TO PIECES!" with your gift jar full of Reece's Pieces. 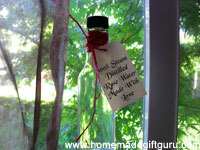 Homemade bath and body gifts are some of the easiest homemade gifts in a jar. They make especially good gifts for women, teens and sometimes even kids. 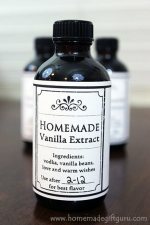 Gourmet infusions and homemade drinks and liqueurs make inexpensive and creative homemade gifts in a jar. 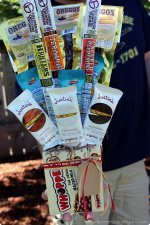 Give them individually for a sweet small gift or pair them up with other homemade goods for a nice gift assortment. 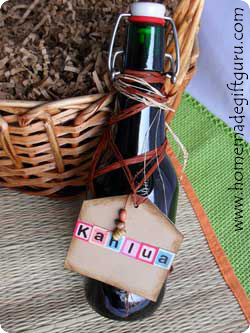 You can find elegant bottles to display them in and close them with corks or embellish the lids they came with. Homemade gifts in a jar can also be decorative! Sometimes it's fun to make a craft project out of your gift giving. 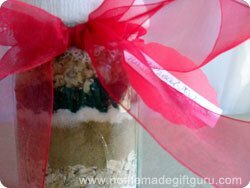 Try this beach scene wedding gift jar for a fun example. You can also make snow globes from mason jars as well as creative candle holders. Canned goods make extremely wholesome and classic homemade gifts in a jar. The rich taste of homemade canned goods is more than welcomed by most. Most canned goods look lovely through the glass and some canning recipes in particular make food masterpieces. Water Bath Canning - High acid foods such as most preserves, jam, jelly, salsa, pickles, fruits and fruit mixtures. Pressure Cooking - Vegetables, soups and stews. Note: Always use tried and true canning recipes and techniques such as those from the Ball website, which is called FreshPreserving.com, click on "recipes". Water bath canning recipes (high acid) are the easiest and least expensive way to start if you're new to canning. Jar gifts are great but if you find yourself with a delicious mix that won't make very interesting layers (all one color for example)... or if your budget demands that you cut out the expense of canning jars... or if a glass jar is impractical for any reason (like because it's a gift for kids and kids don't need to receive heavy glass jars)... you might consider using cellophane treat bags. For example, the play dough mix to the right makes a very cute recipe in a bag rather than a jar gift. Your imagination is the limit when it comes to contents for fun and thrifty gift jar ideas. The jar itself is part of what makes a jar gift inexpensive to make as well as unique and exciting. 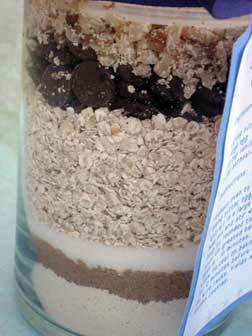 Check out these popular recipes in a Jar!